Already a dominant player in the cargo sector, Miami International Airport (MIA) is working to boost business further with three new initiatives. Two are up and running: a new ocean-to-air shipping program and specialized operations as a pharmaceutical hub. The third, a foreign-trade zone, is pending federal approval, with a decision expected early this year. If zone status is approved, MIA will have a valuable new incentive to offer tenants: reduced, deferred or eliminated duties on materials and finished products they import, assemble, manufacture and export at MIA. Airport officials estimate that a foreign-trade zone at MIA will generate $5.5 million per year in airport revenue and create hundreds of jobs. 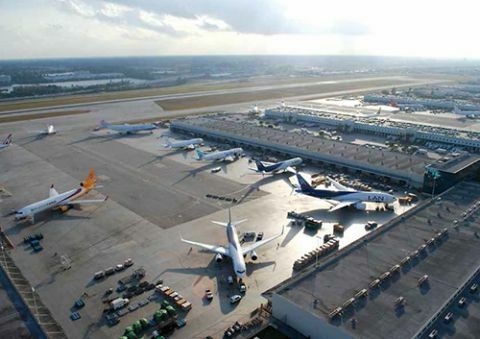 The airport's three-part business development program is tied to a capital improvement program to modernize and upgrade cargo facilities, with an ultimate objective of equipping MIA to handle 4 million metric tons of cargo per year within the next 20 years. The airport's current capacity is 2.5 million metric tons per year. Designating Body: Int'l Air Transport Assoc. "Worldwide growth in air cargo is relatively flat," notes MIA Chief of Staff Joseph Napoli. "We have been able to continue to grow, but at a very low, moderate pace. We are looking for innovative ways we can bring in new business. We are looking to increase our cargo throughput." In 2015, MIA handled 2.2 million U.S. tons of airfreight (an increase of 0.3% over 2014.) Of that total, fully 1.9 million tons was international cargo. In late 2015, MIA became the only airport in the Western Hemisphere to be designated an official pharmaceutical freight hub by the International Air Transport Association (IATA). 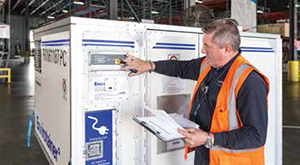 Moreover, 10 of its carriers, freight forwarders and handlers were certified by IATA's Center of Excellence for Independent Validators for shipping cold-chain pharmaceuticals. Napoli explains that IATA and the international pharmaceuticals industry developed the program because product shipment was a weak link in the otherwise very regulated industry. Per the program, pharmaceutical companies will use IATA-certified airlines and handlers to maintain safety and integrity as they ship drugs from factories to distributors. MIA was the second airport to secure IATA designation (behind only Brussels Airport) and is still the only official pharmaceutical hub in the Americas. "We are working to establish several strategic international pharma routes," Napoli reports. In the one year since it received the official IATA designation, MIA has increased its volume of pharmaceutical cargo by 7%. The value, however, has increased 35%. MIA's pharma business is now valued at $3.3 billion. Providing a link between perishable goods grown or produced in Latin America and customers in the Eastern Hemisphere is another area of focus for MIA. Europe, Asia and the Middle East continue to demand more perishables every year, but their limited ability to produce such products locally or fly them in from other countries makes it difficult to meet demand, explains Napoli. "The Latin America and Caribbean region is a dynamo in terms of producing perishables, and many of these products make their way to Miami via ocean transport," he continues, noting that MIA then facilitates final shipping to Europe, Asia and the Middle East. "With its excellent connectivity with South Florida seaports, abundant freight logistics options, and its extensive direct air route network with major cities around the world, MIA offers a viable solution as a major trans-shipment hub for perishables," he elaborates. Last September, the U.S. Department of Agriculture and U.S. Customs and Border Protection approved the shipment of fresh produce arriving at the Port of Miami and the Port of Fort Lauderdale from Latin America to be transferred to MIA's cargo facilities for direct shipment to Europe and Asia. Shippers do not have to pay U.S. duties on produce transiting from the seaport to the airport, because it is not be considered an import into the United States. Prior to winning federal blessing for this program, MIA was already handling nearly 160,000 tons of imported fresh fruits and vegetables annually. The pending component of MIA's three-part cargo plan represents significant upside business potential. In its application for foreign-trade zone status, MIA projects that business within the airport zone would generate $5.5 million in additional airport revenues and create hundreds of new jobs. The airport's total economic impact is estimated at $33.7 billion, with nearly 283,000 direct and indirect employees. If MIA is granted foreign-trade zone status, it will be the last of the 10 largest U.S. cargo airports to be included in the program, according to records of the Foreign-Trade Zones Board, the federal agency responsible for the 296 existing zones. If approved, all of MIA would be included in the zone-about 14 million square feet of office, hangar and cargo space spread over many buildings. Anticipating the designation, Napoli says the airport is working to fill about 523,000 square feet of currently empty space. Businesses operating within the zone would be the main beneficiaries of the federal program. The airport, however, would enjoy increased rental values and gain new incentives to attract tenants. The local economy benefits from jobs created within the zone as well as rents and other local services. From the federal government's perspective, the MIA zone would be viewed as a foreign territory for tax purposes. It would not assess duties on goods that arrive into the zone and are then exported to a foreign location or other U.S. foreign-trade zone. Duties would only be assessed when such goods enter the United States. Erik Autor, president of the National Association of Foreign-Trade Zones, notes that the establishment of foreign-trade zones dates back to 1934, but the way companies leverage them has evolved throughout the decades. Using sites within zones to manufacture or assemble products became popular in the 1980s; and distribution centers started emerging inside zones about 20 years ago. Looking forward, Autor anticipates that the Trump administration will likely support the concept of foreign-trade zones. "Congress created the Foreign-Trade Zone program to promote manufacturing and distribution employment in the United States rather than have those jobs move to foreign countries," he explains. "Continuing a program that encourages the use of foreign and domestic parts in U.S.-based manufacturing in a U.S. foreign-trade zone...would be consistent with the president's goals." Currently, the Foreign-Trade Zones Board reviews about 270 applications per year. According to Autor, MIA's request to expand and join an existing zone is somewhat rare. Most applications are from companies that want to establish operations within a current zone. One of the primary purposes of foreign-trade zones is to encourage U.S.-based manufacturing by companies that assemble products from a variety of foreign parts and then export the completed products into the United States or to foreign countries. Duties are only paid when completed products enter the United States. Companies producing products with a zone pay either the applicable duty on the final product or the sum total of duties applicable to the imported components, whichever is lower. The advantages are different for warehouse operations like those at MIA, which are designed mainly for distribution rather than large-scale manufacturing. In such cases, payment of duties can be delayed and consolidated when bulk shipments are re-packaged for domestic shipment, or avoided entirely if exported to another country, Autor explains. In addition to MIA, businesses that want to participate in the zone will also need to be approved by the U.S. Department of Commerce and U.S. Customs and Border Protection. Businesses currently operating at MIA would not automatically enjoy the benefits of the new airport zone, and would need to apply to the Foreign-Trade Zones Board, notes Napoli. Brinks Global Services USA, in fact, has already applied to include 17,000 square feet of warehouse space at the airport into the proposed MIA zone. While the warehouse space would be a new lease, the firm already rents 4,500 square feet of office space it also hopes to include in the zone, notes Jorge Valencia, the Brinks general manager in Miami. The company's interest in more space builds on MIA's new pharma hub designation. Already an IATA-certified handler, Brinks plans to re-pack and store pharmaceuticals from both inbound and outbound shipments at the company's U.S. and Latin American hub. Valencia says that operating within a foreign-trade zone will increase the company's operating efficiencies and help develop new customers. Because Brinks also plans to handle products other than pharmaceuticals within the zone, it will have to segregate the pharmaceuticals from general product shipments to maintain IATA standards. Given the additional business expected from pharma hub operations, sea-to-air shipping and foreign-trade zone tenants, MIA officials worked with Ricondo & Associates to develop a new master plan for capital improvements to its cargo space. Phase 1 of the Cargo Optimization, Redevelopment and Expansion Plan (CORE) will focus on improving airfield apron and ramp space. The airport hopes to fund the bulk of $8 million worth projects with federal grants and has already applied for FAA funding for design work. Initial projects include extending taxiways that serve the cargo area and widening existing aircraft aprons to add parking for freighters with more cargo capacity-specifically, 10 positions for 747-8s. The second phase, scheduled to begin in about five years, will concentrate on redeveloping and optimizing current space. No specific timelines or price estimates have been developed. CORE will also include some new construction, but onsite space constraints will limit the amount of facilities that are built, notes Napoli. "The goal is to stay competitive and modernize our facilities," he explains, noting the capacity target of 4 million metric tons. "We need to be ready."